Now that the clocks have gone forward and the weather's getting better I decided to mark the start of the second quarter of the year with a hill walk. Nothing strenuous, just a gentle walk in the Western Fans. It's been quite a while since I last went walking in the hills. The day started sunny, but by the time I went out mid-afternoon it was completely overcast. Not good for photos, but pleasant enough for walking. I parked next to the quarries near Pen Rhiw-wen and started by following the Beacons Way up to the tiny summit of Foel Fawr. There's no real path here, the green diamonds of the Beacons Way are a rough guideline rather than a physical route on the ground (don't take them literally when heading west from Foel Fawr or you'll walk over a cliff). Foel Fawr has a surprisingly big cairn for such a small summit and is a good viewpoint. From Foel Fawr I made my way up to Garreg Lwyd, passing a small pool enroute. There was a slightly chilly breeze on the tops so I put my hat on. I picked my way through the rocks to the monster cairn on the summit. In spite of having seen it many times, the cairn was as impressive as ever. I took the obligatory self portrait at the summit, and marked a few GPS waypoints as usual. My GPS was reading a few metres too high, but it wasn't far off. I headed east toward Foel Fraith, but not in a direct line due to rough ground. I soon found a faint path which took me across the col and up the gentle slope to Foel Fraith, and then tried to take me past the indistinct summit on the north side (oddly the Beacons Way takes you past the summit on the south side - but it seems to be following a boundary line rather than an actual path). 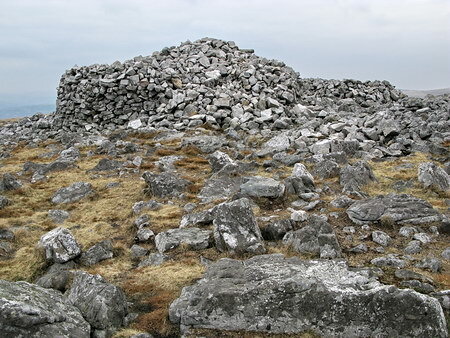 The summit of Foel Fraith has always been a bit of a mystery, due to being very flat with undulating bumps (with different bumps marked as the summit on the 25k, 50k and Harveys maps), but a few years back a fancy cairn was built up there. Myself and Bill Grey tried to determine if it was the actual high point, and we concluded that it almost certainly was. This time though, I couldn't see the cairn. So I began by marking what looked like a possible high point, then I spotted a group of stones on another bump nearby. Sure enough, it was the remains of the cairn, I recognised the distinctly shaped stone that had been placed at the top of the cairn. I marked the spot and the position is almost identical to the spot height on the 25k map. So if you're in doubt, trust the 25k map. I've market the spot with my trekking poles in the photo above. The eastern summits of Mynydd Du could be seen from Foel Fraith in hazy light. One shot above shows the large twin burial mounds on top of Garreg Las, the other a large swallow hole on Foel Frath with the Mynydd Du escarpment in the distance. It was a very peaceful day, with no sounds other than the twittering of birds. I didn't see any other walkers, except at the car park. This is normal for these hills, a great place to get away from it all. I then turned back, heading for a swallow hole waypoint that I'd loaded into my GPS, but when I got close enough to see it I realised it wasn't the location I wanted, namely a tree filled hollow which was a short distance to the NE of it. As I approached I spotted an interesting pile of rocks and took some photos of it. Trees are virtually non-existent on this barren moorland, so it's surprising to find one up here, sheltering in a tiny damp hollow, possibly another swallow hole. There is a hole in the ground here, next to the tree, a deep crack with animal bones at the bottom. I don't know how deep it goes. This is a pleasant sheltered spot for a rest, so I stopped for a snack of walnuts and raisins. After the tree filled hollow I made my way down to the Afon Clydach, then followed it to the west, doing a little bog hopping on the way, until some semblance of a path emerged. There was no longer a breeze so it was quite pleasant in spite of being so cloudy. I then passed below Garreg Lwyd on my return route, heading toward the limestone quarries at the end of the walk, which have made a huge scar in the landscape. I stopped at a small waterfall and took a few pics. Fortunately I had my lightweight tripod with me so with the aid of the Canon G9's built-in ND filter I was able to get some respectably slow shutter speeds for that arty blurred effect. It hadn't rained for quite some time so there was very little water in the river. Shortly after I passed the top of the Clydach waterfalls proper. I took a few snaps from the top but declined to descend to take some proper photos. That would have taken far too long and the day was nearly at an end. Besides, with so little water they wouldn't have been very impressive anyway. Finally, I climbed the second steepest slope of the day back up to the limestone quarry, marked with warnings to stay away from the bases of the cliffs due to loose rocks. There's plenty to see here if you're interested in this sort of thing, old kilns, ruined buildings and so on. I have no idea what's shown in the last photo. I contoured around the hillside through the quarry and was soon back at the car.